Demand for Intel’s Skylake CPUs has been very high since the introduction of the company’s latest processors in August. Even though the manufacturer has ramped up the supply of its Skylake CPUs since its launch, not all users can get these new CPUs. In fact, demand for higher-end Core i5-6600K and Core i7-6700K is so high that retailers recently increased prices of such chips. As a result, the quad-core top-of-the-range Skylake-S microprocessor is now more expensive than even the previous-generation six-core Haswell-E series. 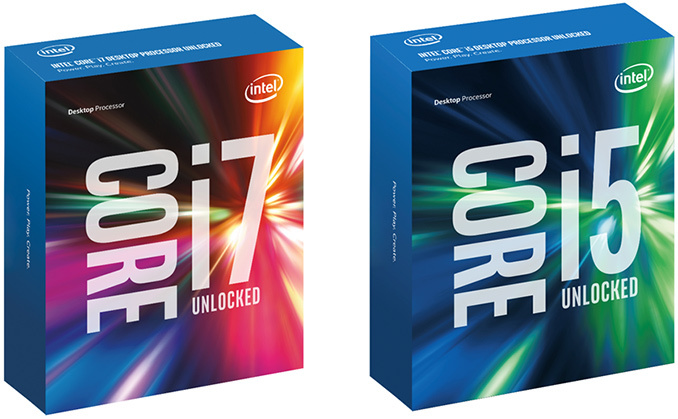 Officially, the recommended customer price of one boxed Intel Core i7-6700K processor (four cores with Hyper-Threading, 4.0GHz/4.20GHz, 8MB cache, Intel HD Graphics 530 core, unlocked multiplier) is $350, according to Intel’s ARK. The recommended price of the Core i5-6600K chip (four cores, 3.50GHz/3.90GHz, 6MB cache, Intel HD Graphics 530 core, unlocked multiplier) is $243. 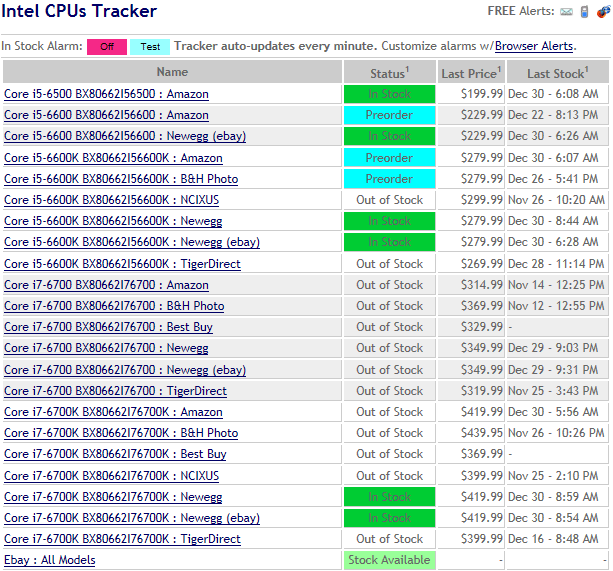 However, at the moment it is not easy to buy thse CPUs without overpaying in the U.S. In fact, not all retailers even have the chips in stock, something that rarely happens to products released over three months ago. 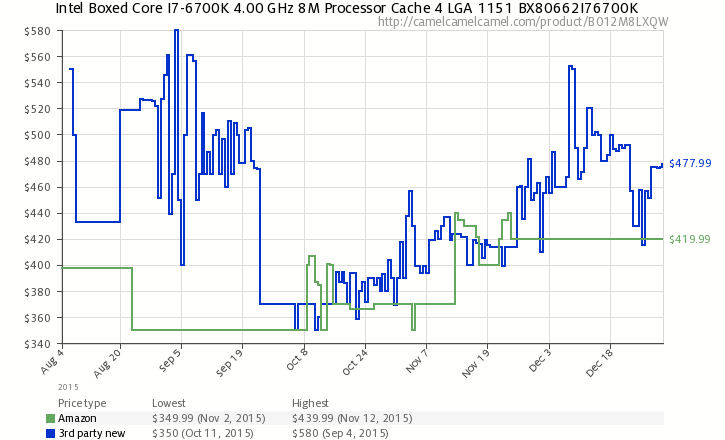 For their part, Amazon does not currently have any Intel Core i7-6700Ks directly in stock. Instead the only 6700Ks available via Amazon are through their third-party marketplace sellers, starting at $499.99, which is nearly $150 higher than the recommended customer price. According to CamelCamelCamel, a price-tracker that monitors Amazon and its partners, the price of the chip began to increase in early October. Meanwhile Newegg sells the Core i7-6700K for $419.99, a smaller increase than Amazon but still higher than both Intel's original price recommendation and the price Newegg was charging at launch. Looking at Newegg's pricing history over at PriceZombie, it looks like Newegg increased the price of the chip beginning in November. 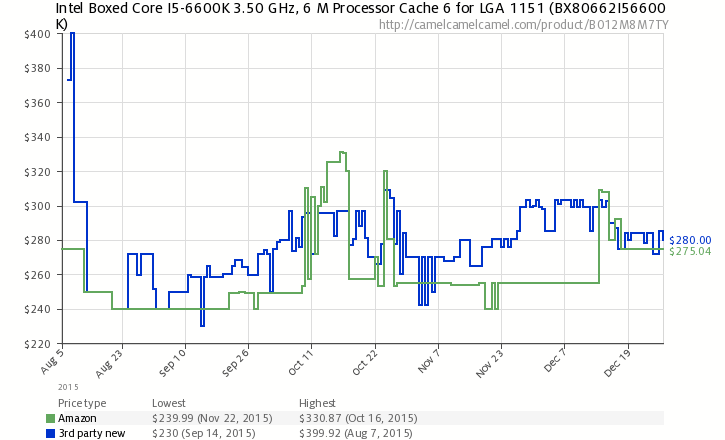 As for Intel’s Core i5-6600K, it's available at Amazon and Newegg for $289.99 and $279.99, respectively. The price of the chip has been fluctuating in both stores and at present the product costs slightly above its $243 MSRP. Given these prices, it is noteworthy (and somewhat surprising) that Intel’s Core i7-5820K processor (six cores with Hyper-Threading, 3.30GHz/3.60GHz, 15MB cache, unlocked multiplier) is down to $389.99 these days, which makes it cheaper than the Skylake 6700K. The fact that the 5820K has to be paired with more expensive LGA2011-3 motherboards as well as quad-channel memory kits ultimately drives up the price of the total kit compared to a Skylake system, but that a still very performant hex-core CPU (ed: with solder!) is cheaper than Intel's flagship quad-core is something we rarely see. If nothing else it's a sign of just how unbounded quad-core pricing has become, though at the same time it thankfully provides a reasonable alternative to the 6700K and some counter-pressure to keep i7 prices from getting even higher. When we asked Intel about what was going on with Skylake prices, they said in an emailed statement that they had not increased the MSRP of the 6600K/6700K - in other words, they had not increased prices on their end. Instead they suggested that select stores might have increased their prices because of strong demand for such chips, which is a pattern we've seen before with video cards and other components. It goes without saying that retailers do not usually increase prices without a reason, as the intense competition among the online PC component retailers makes it difficult to hold too large of a margin under normal circumstances. All of this in turn points to an insufficient supply of microprocessors, with demand significantly exceeding supply. In fact, according to Nowinstock, which monitors availability of various products, many well-known U.S.-based stores did not have high-end Intel Skylake CPUs in their stocks at press time. Intel has previously mentioned that the costs of producing CPUs on their 14nm manufacturing process were higher than the costs of 22nm CPUs due to initially lower 14nm yields. However, the company has never revealed whether yields are a reason why higher-end Skylake-S processors are currently in short supply, or if the problem lies elsewhere in the production chain. With any luck we may find out a bit more once Intel hosts their next earnings conference call in January. Not that there is much demand for them anyway since Intel's products are less and less exciting with every cycle. For my wife's PC there is a good chance I could pick up an i3, slap a huge heatsink on there and have a truly silent PC... which is a big deal for her. For me, access to more USB 3 (and 3.1) ports, typeC support, and better mix support of onboard and dGPU setups, and (above all) support for those fast bubble-gum stick style M.2 SSDs. DDR4 is sort of a plus as well, but less of a big deal. Plus, you can easily fit an i7 and high end GPU in a very small form factor now... very tempting to move out of my ridiculous Cosmos case down to a cute little mATX cube of some sort. How are you going to QTGMC deinterlace your interlaced Blu-rays or use Apple's AAC encoder using Handbrake? I'm running Sandy Bridge-E, 3930K. I would rather simply underclock, undervolt to get the TDP right down and make the system silent for free. Got tons of USB 3.0 ports, only thing I would miss is Type-C. But I don't own any devices with it anyway, so the point is moot. And because of the amount of threads, it is still potent when coming to ripping/encoding/transcoding. I don't think in the history of the PC has a 8+ year old PC still been capable of handling the majority of tasks most would throw at it... The Pentium 4's didn't age well in comparison, that's for sure. An integrated GPU has no business inside of an i7. On the mobile side, it has been useful on very rare occasions, on the Desktop side, give me more cores / cache.